Hello, I found your info very informative, however, I am still looking for the silver bullet on my drain flies. 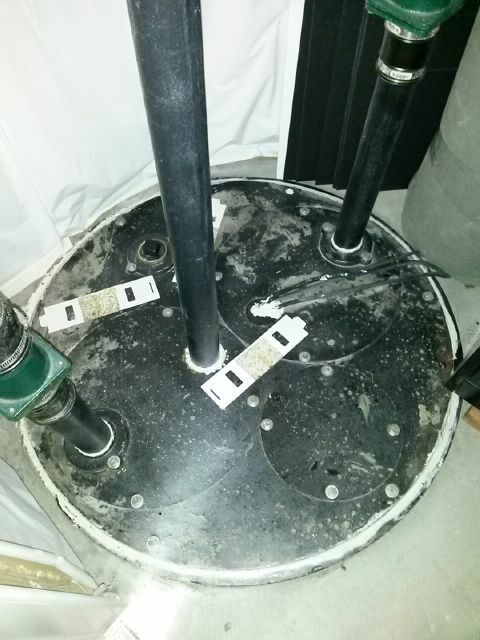 I have a basement in Colorado and we have a sewer ejector pit and pump for the bathroom, approximately 3′ around and 3′ in diameter. We have drain flies coming out the small cracks in the lid but do not wish to open it up and wish to open up only a small portion of the lid and drop a small bug bomb inside to kill them and the eggs. It’s extremely key that we find the correct bomb that can 1.) drop into this small 3’x3′ space, but 2.) kill not only the adults but the eggs. All other products are useless in this application as anything I pour into the drains just settles at the bottom of the sewer ejector pit and we believe they are all living and thriving on the underside of the lid and the sides, so we need bomb them but it must be proven to kill the eggs. Please do give us some of your proven ideas and/or products as we would greatly appreciate it! Its interesting how we get requests all the time for products that don’t exist. Simply put, there is no such “fogger” like the one you seek. And I don’t foresee any such product coming to market that will perform like what you want. I say this for many reasons. 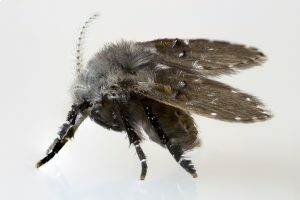 The big reason is that the place where you need to control this pest is basically an “uncontrollable pest environment”. There is so much raw sewage that no chemical can withstand the harsh environment. So even if you were to remove the lid and spray heavy amounts of liquids (which are stronger than aerosols), your effort would be in vain. True you would kill some. But these pests live under and in the excrement so they are essentially hidden and protected from things like chemicals that might otherwise hurt them. And once the treatment dissolves and washes away, they’ll repopulate and continue on as if nothing was done. A tiny drain fly taken at nearly 5X magnification. These are found in damp and humid places, and are true flies. The good news is I’ve seen this exact problem before and I know how we dealt with resolving the problem. Also, the treatment was easy. The first thing to understand is that your system is a contained environment. Its very different from everything else around it both in the ground and above the ground. The next thing to understand is that in this environment, nasty things can thrive. And they do. Lots of them. Most of these living organisms don’t want to leave the system and 99.9% of them are so small you can’t see them. But there are a few large enough to be seen and if programmed to migrate up seeking new areas to establish with nests (what we call “population expansion”), there is a good chance they’ll conflict with anyone in that area. In this case it sounds like drain flies are coming up and out of the system and conflicting with you once they enter living areas. And I’m guessing this is happening in either the bathroom or some area of the basement. So what then is the best way to treat the problem? Well, there two things that can be done. 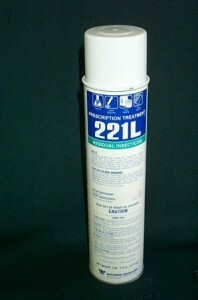 The first is to apply PT-221 inside the tank, under the lid, around the lid seal, etc. This can be done through a slight crack, seam or gap already in place they’re no doubt using. PT-221 comes with a “straw” you can use to direct the product into the void below. This straw is thin, like the straw used on a can of WD-40, and is flexible. Once under the lid, you’ll want to let it run for 10-20 seconds so the area inside under the lid will get thoroughly treated. Next, spray the exterior surface area making sure to cover all seals, valves, pipe fittings, etc. Next, install an AEROSOL MACHINE with some METERED INSECTICIDE. Place the machine within 5 feet of the lid and from the picture you sent, it would appear you could set it on the ground where it would have a direct line of spray. Once the machine is fitted with two AA batteries, filled with a can of Metered Insecticide and turned on, it will release a small blast of pyrethrin every 15 minutes to the area. This treatment is harmless to people or pets but deadly to flying insects like flies, moths, gnats, etc. The can will last 30-40 days and since its constantly “renewing” the treatment every 15 minutes, it will kill all hatching drain flies before they escape the area. This treatment will yield instant results. Within one day of getting the machine installed, hatching or escaping drain flies around the lid will be dead and over a few weeks of running the machine, there will be less and less out and about laying eggs. This will effectively stop the problem as their numbers will eventually run out. True, it might still be active in the system underground. But as explained above, there is no way to defeat the cycle under the lid given the harsh environment so the best you can hope to do is to confine them to that area and prevent them from gaining access to your living spaces. Keep in mind this treatment will not impact the equipment or interfere with the system in any way. If anything, it might “lubricate” it but given how much wet organic matter is passing through the area, I’m afraid there won’t be much lingering residual like we get in a clean living area. Now if you’re seeing them in other rooms, it could be they’re coming up through drain lines that connect to showers or sinks. For these areas you will need to spray the PT-221 down the drain and if that doesn’t stop them from emerging after treating twice a week for two weeks, install an Aerosol Machine in these rooms alongside the drain. Use one machine for every 400 sq/ft of area needing protection and keep them running around the clock. Refills will last 30 days but if you keep them renewed during the active season, you should be able to stop them. In the end, the PT-221 and Aerosol Machine will prove to be the 1-2 punch that will defeat the invasion of this pest into your living spaces. Based on the usage rate I’m recommending, I believe once can of PT-221 will be enough to treat the area 10-20 times no problem. Aerosol machines can cover up to 400 sq/ft per machine and are about 1/2 the size of a small cigar box so they’re discreet. And they can be hung on the wall too, above the active areas. Metered Insecticide will have a slight odor but for use around the pump system, this should not be noticeable or cause for concern. But if you prefer to use our “odorless” refill, go with the CLEAR ZONE. Essentially the same exact material but with no odor making it ideal for living spaces. I have a sewer zoeller ejector pump. Will this product harm the equipment in any way? When used properly, no. But you wouldn’t want to take the PT-221 and then use the straw to inject it directly into any electrical component. No doubt this would probably cause some issues but you’d have to misapply it for this to happen. As for the Aerosol Machines with Clear Zone or Metered Insecticide; they can be used in close proximity to the equipment and not cause a problem since they only release a small 1/2 second blast of chemical one cannot even see. In other words, the amount being applied is so little and minute, it won’t bother anything but the bugs. Thank you so very much for this helpful blog post. We were struggling with this issue for so long and even our Orkin man could not solve it. After reading your post several months ago we purchased the recommended supplies and eliminated the problem. We stopped treatment and started noticing drain flies again, so we will resume the course of action recommended. We appreciate your help!